Despite the healthcare team’s best efforts, not all hospitalizations go smoothly. This article describes the case of an obese patient who underwent bariatric surgery. After a 62-day hospital stay, during which a multidisciplinary team collaborated to deliver the best care possible, he died. Although the outcome certainly wasn’t what we wanted, we’d like to share his story to raise awareness of the challenges of caring for bariatric patients. Obesity isn’t just a cosmetic problem; it’s a health hazard. Someone who’s 40% overweight is twice as likely to die prematurely as someone of normal weight. Obesity has been linked to many serious medical conditions, including cardiovascular disease and stroke, high blood pressure, diabetes, cancer, gallbladder disease and gallstones, osteoarthritis, gout, respiratory problems (such as sleep apnea), depression, gynecologic disorders, erectile dysfunction and other sexual health issues, nonalcoholic fatty liver disease, and metabolic syndrome (a combination of high blood glucose, high blood pressure, and high triglyceride and cholesterol levels). Obesity also causes skin problems, such as poor wound healing. In obese persons, most wounds arise secondary to poor hygiene related to obesity. Bariatric procedures fall into two main categories—restrictive and malabsorptive. Restrictive procedures limit the amount of food the stomach can hold, with the goal of reducing caloric intake. Malabsorptive procedures bypass part of the small intestine, decreasing the amount of calories and nutrients the body absorbs. Some procedures are both restrictive and malabsorptive. Various GI complications may arise after bariatric surgery, including abdominal pain, nausea, vomiting, diarrhea, hernias, and ulcers. Common nutrient deficiencies associated with such surgery involve protein, calories, calcium, iron, copper, thiamine, vitamins A, B1, B6, B12, C, D, E, and K, and folic acid. Nutrient deficiencies depend on the length of the absorptive area and percentage of weight loss. These deficiencies progress over time. However, they can be prevented with the help of a multidisciplinary team. Unless nutrition is addressed, patients with surgical complications may experience impaired wound healing, wound dehiscence, pressure ulcers, chronic wound infections, necrotizing fasciitis, decreased cardiac and respiratory functions, increased morbidity, and even death. Nutrition plays a critical role in skin integrity, and lack of proper nutrition can lead to pressure ulcers, necrotizing fasciitis, venous stasis ulcers, wound dehiscence, and chronic wound infections. promotes postoperative healing, which helps avoid complications. After bariatric surgery, barriers to adequate nutrition include lack of physician and nutritionist collaboration, poor I.V. access, hemodynamic instability, hyperglycemia, and fluid volume imbalances. Removing these barriers requires a nutritional plan that begins before surgery. For 24 to 48 hours after surgery, the patient should receive nutritional support (preferably enteral feedings). Such support is based on factors that contribute to physiologic stress, such as mechanical ventilation, fever, and extent of surgical wounds. Patients should receive a high-protein diet: 2 to 2.5 g/kg of ideal body weight (IBW), with 11 to 14 kcals/kg actual dry weight, or 22 to 25 kcals/kg IBW. Clinicians should stay alert for common nutrient deficiencies. Enteral nutrition support commonly is the first choice for patients with a functional gut. Parenteral nutrition support is considered in patients with severe nausea or vomiting and gastric leaks. Ongoing monitoring of response to nutrition therapy with timely adjustment of the nutrition care plan is an important part of patient management. The case of Gary T.
Gary T. (not his real name), a 42-year-old male, weighed 671 lb (304 kg) before LRYGB surgery; his BMI was 86.1. (Sixty days after surgery, his BMI had dropped to 66.1.) His comorbidities included diabetes, hypertension, and peripheral vascular disease. Before and after surgery, the dietitian worked with Gary to address his nutritional needs. However, within 24 hours after surgery, his vital signs became unstable and he developed rhabdomyolysis (probably from his morbid obesity in conjunction with prolonged surgery). The nurse noted a deep-tissue injury (DTI) to the sacrum, possibly from the prolonged (7-hour) surgery and inadequate padding of the operating-room (OR) table. Eschar was firm, and the nurse applied an intact foam dressing to prevent further tissue injury. Gary subsequently suffered multiple complications, many resulting at least partly from his poor nutritional status secondary to obesity. Below, members of the care team present their perspectives. One day after surgery, Gary developed rhabdomyolysis, a syndrome of muscle necrosis with release of muscle enzymes into the circulation, leading to electrolyte imbalances and acute kidney injury. His creatine phosphokinase (CPK) level rose to 50,380 mcg/L; normal range is 0 to 235 mcg/L. At the time, we thought his extremely high CPK level resulted from the sacral DTI secondary to prolonged surgery with the patient in one position and an inadequately padded OR table, in the setting of morbid obesity. CPK rises within 2 to 12 hours after onset of muscle injury and peaks in 24 to 72 hours; half-life is 1.5 days. CPK decreases by 40% to 50% daily unless continuous muscle injury occurs. Gary’s CPK level stayed above 1,000 mcg/L for 2 weeks and didn’t normalize until 6 weeks later. This contributed to prolonged renal failure, which persisted throughout his 2-month hospital stay. Gary received prophylactic cefazolin during and immediately after surgery. We expected him to have early postoperative fevers. His initial urine, blood, and respiratory cultures were negative, as was a methicillin-resistant Staphylococcus aureus nasal swab. He also received 1 to 2 days of piperacillin-tazobactam as empiric therapy due to the fevers. One week after surgery, Gary’s white blood cell (WBC) count rose and purulent drainage appeared in his Jackson-Pratt drain. Drainage cultures showed two modestly resistant Escherichia coli strains, a few streptococcal species, an anaerobe, and one yeast strain. GI flora were presumed to be present due to an anastomotic leak. Four weeks after surgery, Gary’s blood cultures showed carbapenem-resistant Enterobacter, limiting his treatment options. At 5 weeks postoperatively, his necrotic decubitus ulcer was debrided; cultures were mixed but included the highly resistant Enterobacter. At 7 weeks, Pseudomonas was isolated from another decubitus debridement; this probably resulted from his previous tigecycline therapy, to which Pseudomonas is inherently resistant (given during postop week 3). Stenotrophomonas, which is inherently resistant to carbapenems, was isolated from his sputum following carbapenem treatment. In addition, non-albicans Candida was isolated in the urine, and stemmed from his previous fluconazole therapy. Vancomycin-resistant enterococci were isolated in his blood because of his previous broad-spectrum antibiotic therapy. Duration and breadth of antibiotic therapy predicts which resistant organisms will be found later. Antibiotics can’t fix surgical problems—in this case, anastomotic leaks and necrotic ulcer tissue. Extended and broad antibiotic therapy can lead to additional complications, including excess drug toxicity, multidrug resistant infections and Clostridium difficile colitis. On the first postop day, Gary required bilevel positive-airway pressure treatment because he developed atelectasis from complications of prolonged surgery and inability to move due to acute postoperative pain. This condition eventually progressed to acute respiratory failure, necessitating ventilation. Mechanical ventilation continued for 2 weeks, with multiple failed weaning attempts related to new emergence of various infections, in turn leading to a cycle of systemic inflammatory response syndrome (SIRS), sepsis, severe sepsis, and multi-organ dysfunction syndrome (MODS). As a result, Gary required multiple vasopressors and continuous venovenous hemofiltration to manage hemodynamic MODS complications. After one infection was treated, another one emerged, and the cycle began again. Two weeks after surgery, a tracheostomy was done because of Gary’s inability to wean; the goal was to reduce the risk of ventilator-associated pneumonia linked to longer intubation. Maximum duration for an internal jugular dialysis catheter is 3 weeks, due to the infection risk. Gary’s catheter had to be replaced three times during his hospital stay. He also had a left subclavian central line for central venous pressure (CVP) monitoring and vasopressor therapies. Keeping a CVP line in place too long can lead to infection, so a peripherally inserted central line was placed. Throughout his entire stay, Gary was compromised and had abnormal laboratory values. His albumin level ranged from 1.9 to 2.2 g/dL (normal range, 3.5 to 5.2 g/dL); blood glucose ranged from 79 to 424 mg/dL (normal range, 80 to 120 mg/dL); prealbumin measured 9 mg/dL (normal range, 18 to 45 mg/dL); and WBC count ranged from 15,100 to 39,400 cells/mm3 (normal range, 4,000 to 11,000 cells/mm3). Gary’s weight ranged from 671 lb (304 kg) to 514 lb (233 kg). Although the dietitians and physicians collaborated to develop a plan for nutritional support, Gary’s obesity and comorbidities made it difficult to gain traction in healing his wounds. Wound care was a particular challenge. It took more than 1 hour daily to reposition Gary and clean and dress his wound with intact eschar, and nearly 2 hours for open wounds. Transporters (usually three or four at a time) aided in turning and repositioning him. A self-turning bed that assists with right and left turns was used. The wound care nurse, physicians, and a dietitian were present for daily wound care. Gary’s wife was at the bedside to provide comfort. 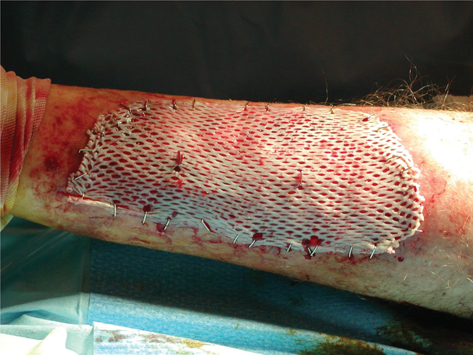 For patients in optimal health, debridement, pressure relief, and moisture-retentive dressings can aid wound healing. But Gary wasn’t in optimal health. When his hospital stay exceeded 30 days, he had to be transferred to another facility. The extra-special handling required for the move included an additional air mattress and additional foam protection. His situation became even more complicated and he required additional care and handling. In the new location, Gary’s sacral wound suddenly became malodorous. The eschar was boggy but remained intact with no drainage. A partial CT scan (Gary couldn’t fit into the scanner entirely) revealed gas gangrene. Bedside sharp debridement was performed immediately. The pathology report showed Gram-positive cocci and rods—morphologies of common anaerobic organisms that can cause gangrene. Despite medical and nursing interventions, Gary was visibly deteriorating. On day 61, everyone involved in his care, including his wife, met and decided to withhold all life-sustaining measures. He died soon after being removed from the ventilator. 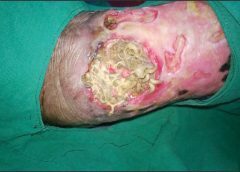 As this case demonstrates, a good patient outcome may not be possible even with optimal management of nutrition, wounds, and infection by a competent, dedicated healthcare team. When the patient continues to deteriorate, as Gary did, keeping him comfortable and maintaining his dignity take the highest priority. Hedy Badolato and Denise Dacey are dietitians. Connie Johnson is a wound care nurse. Kim Stevens and Jen Fox are staff nurses. Hatim Youssef is an intensivist. Scott Sinner is an infectious disease specialist.